Well, this year was a gorgeous year to capture some peony seedling photos. The neatest thing about seedlings is knowing that no one else in the world had the same peony as you. Deciding which ones are good enough to share with the world (and hopefully convince others of that same idea) is the hard part. I'm not sure how close I am into my first foray in that arena, but I thought I'd give you all a taste of what's growing in my peony seedling beds right now that excites me... These peonies are in order of bloom date. Parents: 'Lavender Princess' X ? I know this bloom photo looks a bit sad. I'm not sure if I caught a great photo of it or not. I'm hoping once I move this one it might do better. So the flower itself is not what interests me the most on this one, especially since this is the first time I've seen it bloom double. The most interesting thing about this seedling is the fact that it was the only double blooming in my yard at the time, April 22, 2018. No other double had yet to bloom. So this makes it seem like a rare occurrence to get such an early blooming lactiflora peony. Since this was the first year I've seen it bloom double, I need to move it to see if it continues to bloom double and bloom so early in the season. Also the flower and bush form needs to be checked when it is growing with adequate space. This peony is also an early blooming seedling, this one being semi-double. It seems I failed to mark and capture data on this peony this year. So I'll need to pay better attention to it this spring to check the location and identity of this seedling. The semi-double light pink bloom is just gorgeous, and I can't wait to see how this one develops (and how the bush looks with lots of blooms on it). In this photo it kind of reminds me of Peony 'Silvia Saunders' (which I do not yet grow, so have only seen in photographs). Parents: 'Pink Princess' X ? This pretty white peony seemed to 'pop' out of nowhere. This peony was the first to herbaceous seedling to bloom in my newer seedling bed, which I started planting in 2013. It is a cute anemone type peony, and it kind of reminds me of a white 'Gay Paree'. This is the first year it has bloomed, so I'm curious to see if it will change form next year. This peony which I've nicknamed 'Lavender Ruffles' has been a longtime favorite seedling of mine. It first impressed me with a semi-double bloom in 2014. Since that time it has been double and then back to semi-double and then it has even had some double, some semi-double on the same bush. I can't wait to see what it does next year! Maybe I will divide it next year to see how well it does with propagation. Peony 'Lavender Ruffles' is a seedling of 'Lavender Princess' from 2008. This peony is a later blooming peony. It is so nice to have a color like 'Lavender' with so many petals at a later time in the season! 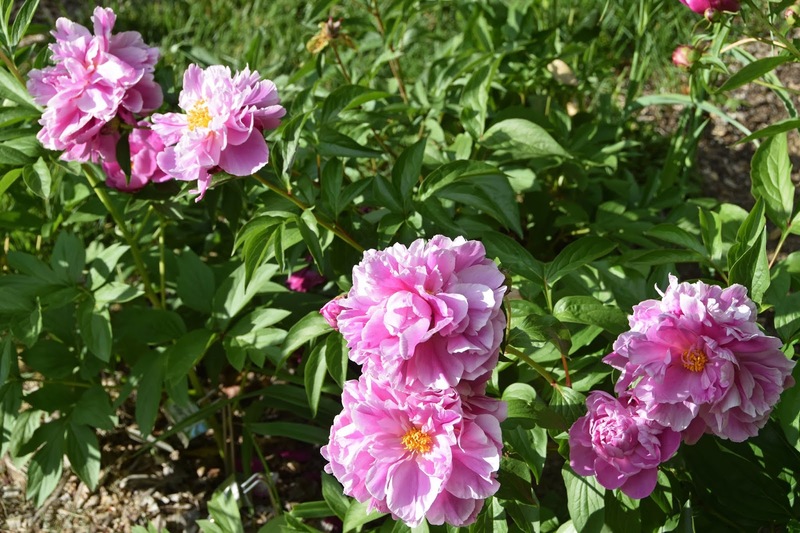 This peony seems to be quite floriferous with several blooms on each stem. Despite the multitude of blooms, the flowers seem to be able to stay off the ground. This one seems to be quite promising! This peony is newly double for me. I'm not sure exactly when it started blooming, but it did have 3 large size very double blooms all on one stem this year. The flowers were so big and so heavy that all three of the massively-petaled flowers weighed down the single stem they were carried on until they bent the stem under their weight. I'm not sure if I noticed these blooms upon first opening. So I didn't bother taking a color reading until perhaps next year. It looks like I need to capture a few more data points about this seedling too. This peony has a nice bright hot pink color (which I haven't seem to have color matched yet), and I like how late it blooms, but I'm just not sure about how well it can keep the flowers off the ground. I like that it has a late bloom season to add some color to the garden when the other peonies have finished. It kind of reminds me of 'Karl Rosenfield'. So I'd like to see how this one might be able to differentiate itself. My 'Karl Rosenfield' seems to be very susceptible to black spot/blight. Let's hope this peony is a bit more resistant.